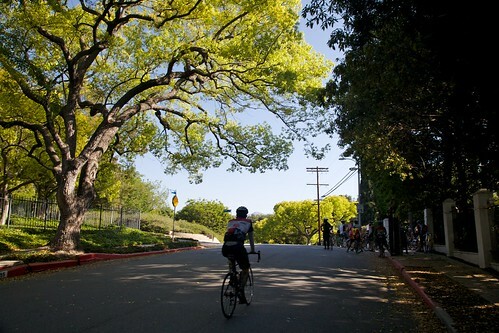 The 2011 Feel My Legs, I’m a Racer meets at Sunset Blvd/Griffth Park Blvd at 745am on Sunday April 10th. Since setting the date for the 2011 Feel My Legs, I’m a Racer, I’ve gotten a few questions from people unfamiliar with the event that I want to address. While there are a few riders ‘racing’ for points, the majority of the people who come out are challenging themselves to the 10 hardest hills I could find in Los Angeles. We usually get about 50 folks starting, but only 5, maybe 10, actually get any points on the hills. Obviously being able to climb steep and/or long hills is a requirement to finish this event, but so is a desire to explore neighborhoods and places most people will who live in this great city will never see. It’s less of a race and more of a group of friends (or soon to be friends!) out for a day of hard riding and exploring. Can I ride fixed gear? I doubt it. We ride together from hill to hill and any gear that you could get up these hills with will be too low to stay with the group. You are welcome to come out and prove me wrong though. No! Well, probably not. We ride as a group from hill to hill at a chill pace. At each hill it will be obvious where to go. At any turns or confusing parts I’ll have chalk and/or a volunteer. We regroup at the top only after the last person has made it up. Do I get a meal or picnic or something out of this? I wish. In the past we’ve done everything from pancake breakfasts to full-on picnics. 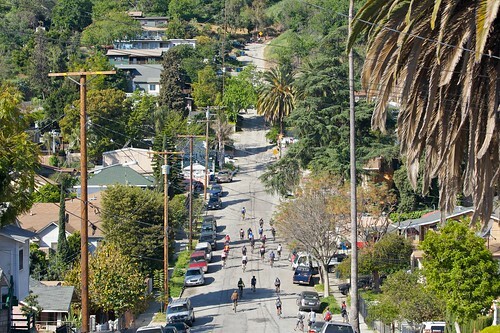 This year we’re going to head over to CicLAvia and probably eat, hang out on the route. There will be a spoke card! My bike club, known as Swarm!. We ride everything from alley cats to international UCI track events. We think the world would be a better place if people rode bikes and ate vegan more often. My friend wants to watch, can he drive along the course and stop at the hills? No. Definitely not. We’re going to be on some narrow roads in quiet neighborhoods; I don’t want to add to the car traffic. He can ride a bike along with us and I’ll help navigate the best places to see and how to get around. By the end almost half the people with us are just there to watch and cheer on the riders! I hope to be done between 12 and 1pm. Why did you stop making fun of Bryan Farhy? After 5 years of naming vegan events after him over an anti-vegan email, he recently sent me an apology and I’m letting it go. Don’t tell any of my east coast friends that I let go of a grudge. Thanks for asking! I need help getting the word out. Please send this info and links to the pages to your bike club/crew/gang. I also may need some volunteers the day of. Getting up and down the hill may or may not be required. Photography is always appreciated, but again, by bike and not cars. Get in touch at bikeswarm [at] gmail. Great event, thanks to Matt and everyone else for organizing. I couldn’t quite get up all 10 without putting a foot down, but the compact crank and 28t cassette got me up Eldred and Fargo eventually.